For more information on shuffleboard table thickness and why it’s important, read our article here. The first step you’ll need to take involves cleaning the table. This consists of the biggest difference in care between traditionally finished and polymer finished shuffleboard tables. However, the process isn’t difficult, and all you need is some vinegar and water to wipe down the table. You should use ¼ cup of vinegar and enough water to keep the towel damp. You also have the option of adding in olive oil or wood polish. 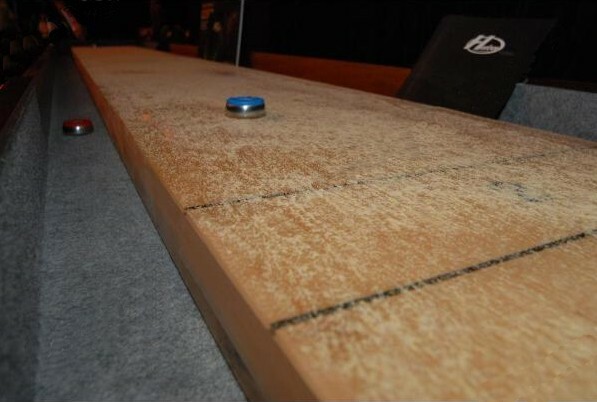 The acidic vinegar breaks down the dirt and grime that accumulate naturally as your shuffleboard ages. Because acids dry out wooden surfaces, bases like olive oil or wood polish bring the moisture back, preserving the lacquer finish for longer periods of time. While adding oils and/or wood polish to the mix of water and vinegar is optional, these extra ingredients will improve the shine, breathing life back into your shuffleboard. Depending on usage, you should clean your shuffleboards approximately 1-3 times a month. To maximize the quality of your plays, you’ll need to use a silicone spray to go over the entire shuffleboard table as well. Just like proper waxes, there are special silicone sprays you should use that are also provided in maintenance kits or online with other shuffleboard accessories. Simply spray in a sweeping motion across your table. Make sure you don’t miss a spot! Let the spray sit on the table for a few minutes, then pat it down with a towel in the same way as the previous step. Although it is usually referred to as “shuffleboard wax,” this important piece of the overall puzzle is very different from other waxes. Shuffleboard wax looks more like a powder than actual wax, and is one of the most common yet essential accessories. For the full explanation of shuffleboard wax, its composition, and its uses, please see our article here. Shuffleboards with polymer finishes are easier to clean and maintain than those with traditional or lacquered wood finishes. 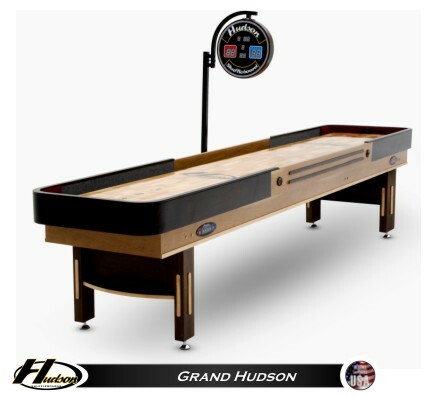 This 9’ Grand Hudson Shuffleboard Table has a polymer finish. Unlike the process for shuffleboards with traditional finishes, all you’ll need for this step is a multipurpose, glass, or window cleaner. It’s best to avoid cleaners with harsher chemicals like bleach. Spray the cleaner over the surface, using the damp rag or soft towel to buff the table down. If you want the best results, you should use a shuffleboard brush to wipe off excess grains before you spray your table down. Just like traditional finishes, you will need to perform this cleaning process approximately 1-3 times per month, depending on how often you use your shuffleboard. 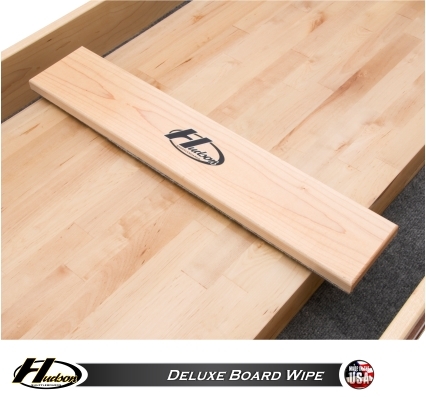 For this step, you will need to use silicone spray designed specifically for shuffleboards. Apply the spray in a sweeping motion across the whole table. Let the spray sit on the table for a few minutes, then pat it down with a towel in the same way as the previous step. Although it is usually referred to as “shuffleboard wax,” this important piece of the overall puzzle is very different from regular waxes. Shuffleboard wax looks more like a powder than actual wax, and is one of the most common yet essential accessories. The Grand Hudson Shuffleboard Table has been waxed to perfection. This Grand Hudson Shuffleboard Table has been waxed to perfection. Proper maintenance may seem like a hassle at first, but it’s extremely important to optimize the longevity of your shuffleboard table. After performing the process a few times, it’ll feel like a second nature. Keeping your shuffleboard table in tip top shape is the #1 duty of a proper shuffleboard owner. 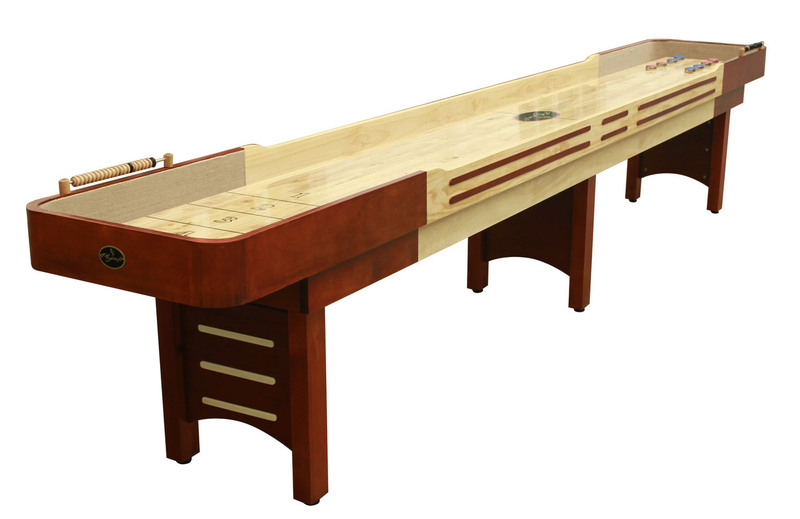 See our assortment of shuffleboard accessories here. This entry was posted in shuffleboard-table-maintenance by admin. Bookmark the permalink.